An important component of any filtration system is the physical or chemical material designed to separate suspended solids and particulate matter from the water supply and allowing the water to pass through. Materials used in filtration are generally referred to as filtration media and come in a wide array of materials and sizes. 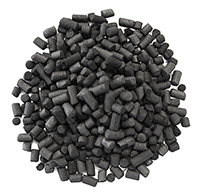 Certain materials are better suited in the removal of specific types of solids, thus most filter media beds are a combination of different materials including filter sand, gravel, anthracite, green sand, garnet, and activated carbon. All Water Systems stocks a complete assortment of water filtration media to meet our clients’ needs and uses our 30 plus years in business to select the right type of water filtration media as well as how much and how often the media should be replaced. We take the time to fully understand your water usage and requirements in order to provide an exceptional level of service from media replacement to fully servicing or monitoring your water filtration systems. This is a highly effective in the reduction of undesirable tastes and odors associated with chlorinated water supplies. They include water filters for removing chlorine and organic contaminants from water used in commercial and industrial applications. Promotes higher service flow rates and longer filter runs with less head loss than single media filter beds. Backwash rates are reduced as well. Low uniformity coefficient anthracite filter media extends the life of your filter before the media must be changed out. Acidic waters will slowly dissolve the calcium carbonates to raise the pH which reduces the potential of copper, lead and other metals found in water filtration systems. Almandite garnet is a high hardness, high density granular filter media. It can be used extremely effectively as the lower strata in a dual media filter bed. 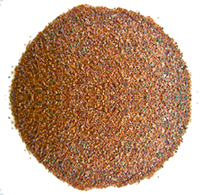 Its high specific gravity as well as its chemical and abrasive resistance makes garnet ideal for filtration media. This material offers a high surface charge density and high cation exchange capacity. Because it can bind to so many materials it is often used as water filtration media for a variety of applications and industries. This high capacity, high quality gel-type cation resin is capable of meeting the most exacting requirements of commercial, institutional and industrial water softeners. It is supplied in sodium form as colored translucent beads and does not contain chlorinated solvents. The manufacturing process insures low taste, odor and color throw for potable waters. For More Information on water filtration media, call (412) 824-6560, or click here to contact us.